Listen closely. Do you hear the drums and horns marching over the horizon? Those are the sounds of Germans preparing for Fasching, or Lent as Americans know it. Parades are one of the cornerstones of this week-long celebration. Germans take off work and celebrate merrily in the streets, while taking part in and watching any number of munificent, city-wide parades. Coming up in a few days is the mother of them all, Rosenmontag (Montag=Monday) or Rosenmontagsumzug (Monday parade). Most people believe it translates to Rose Monday, but the actual meaning comes from the German verb rasen – to rush, rave, or boogie. With a name like Rage Monday you can imagine the atmosphere and the fun that ensues. As February draws to a close, the Catholic calendar draws nearer to Lent, the English version of Fasching or Karneval or Fastnacht, depending on which region you’re in. Americans in Soulard, St. Louis, Missouri. Soulard is largely believed to be the second biggest Fasching event in America, behind Mardi Gras in New Orleans. The customs between the countries are wholly different, but the idea of feasts and festivities before the fasting season is the same. If you find yourself in Germany as the Lenten season starts, you are sure to find local parades and festivities, but most will say the biggest celebrations take place in Düsseldorf, Cologne, and Mainz. This year, Fasching kicks off on February 27th with Weiberfastnacht, which is traditionally a women’s holiday in northern regions. Throughout the day, women will snip off men’s ties (a status symbol) then reward them with a Bützchen, or little kiss. What a way to kick off the weekend. The whole city then celebrates all weekend before the big parades on Monday, March 3rd this year. The next and final day is Fastnachtsdienstag on Tuesday. There aren’t many parades on this day, most of the focus is around either burying or burning der Nubbel, a life-sized doll built to symbolize the collective excesses or transgressions of the past season. Curiously enough a native German told me she’d never heard of this event. It’s celebrated in the western half of the country near Cologne and Mainz, so it’s evident there are different traditions throughout Germany. The scapegoat as it were is burned or buried Tuesday evening and everyone celebrates one last time before Aschermittwoch, or Ash Wednesday, the official start of Lent. Suffice it to say, there’s no shortage of camaraderie and celebration this week every year. It’s my goal to see at least one Rosenmontagszug before I die, as it should be for you too. 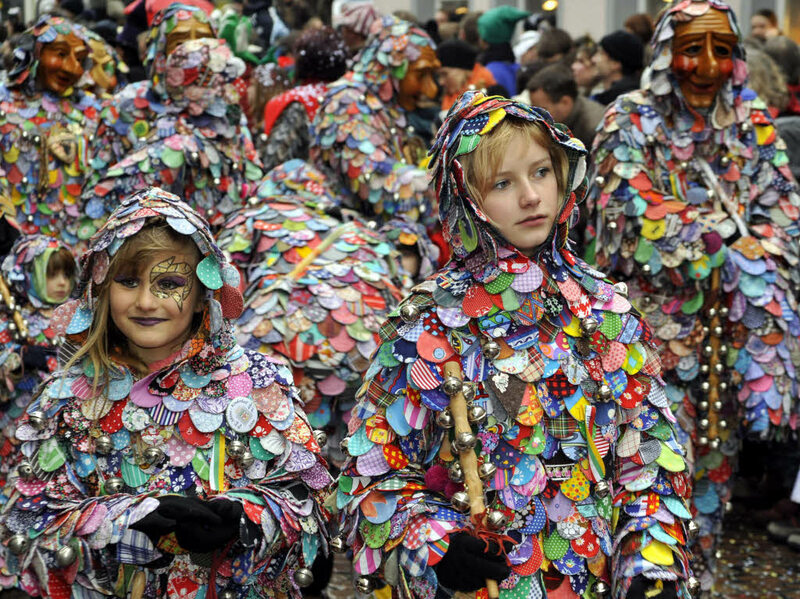 This entry was posted in Events, German and tagged Fasching, German History, Karneval, Köln, Parade, Rosenmontag, Umzug. I had no idea St. Louis had a Fasching celebration! They definitely don’t advertise it that way, I think it just gets lumped together with Mardi Gras. Considering how much German heritage St. Louis has, I’d think that they’d try to emphasize the Fasching connection.